The Bardons & Oliver TBC automatic lathe, with associated handling equipment and CNC control, provides a systems approach to producing parts in a single operation. The TBC performs a variety of functions that usually requires several machines which speeds production and cuts costs. Versatile. Turns, bores, threads and performs tube and bar cutting. Speeds production. Produces parts in one operation that formerly required multiple operations such as cut-off and chucking. Reduces overhead. Magazine-type loading tables and automatic part pick-off attachments eliminate manual handling of parts. One operator can run several machines. Cuts costs. Ideal for efficiently handling simple large diameter tubing and bar jobs that are normally run on significantly higher cost, slower machines. One unit performs functions of several machines. Less expensive than conventional thru-hole CNC machines. Saves floor space. The TBC requires less space than ordinary large hole CNC lathes. Simple tooling. Allows family or similar parts to be run using the same tool holders and inserts. SHORT SIMPLE PARTS Block tooling for turn, bore, chamfer and face and cut-off. Retractable stop for short feed out lengths. Automatic part pick-off attachment, part blow-off station and stripper for discharge. SHORT COMPLEX PARTS 8 Station disc type turret for turn, bore, profile, groove, thread and cut-off. Retractable stop for short feed out lengths. Automatic part pick-off attachment, part blow-off station and stripper for discharge. LONG PARTS 8 Station disc type turret OR 8 Station disc type turret with live tooling. Retractable stop mounted on ways with ball screw drive programmable adjustment. Automatic special long part steady rest support and unloader with discharge table. 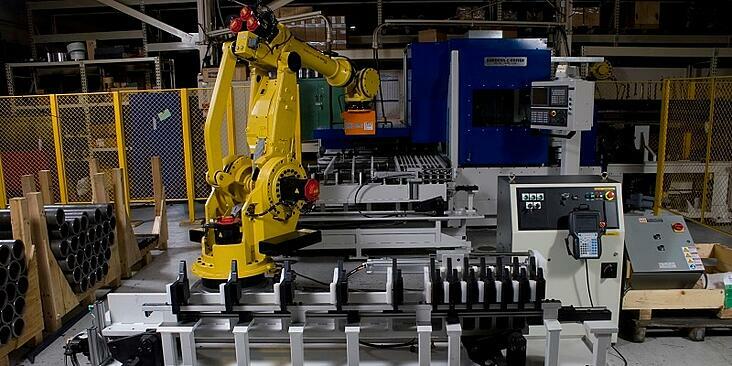 FANUC CNC CONTROL Standard CNC programming or custom software for your application. AUTOMATIC MAGAZINE LOADING Automatic barfeeder tables keep stock in the machines at all times, which lets one operator run more than one machine. All material handling equipment is designed with unitized construction, so it can be easily modified to meet your specific requirements. The loading table loads one length of material after another into the machine and then automatically crops a pre-determined amount off the leading end and ejects the remnant end. HEAVY DUTY STOCK STOP The stop is mounted on two rigid large steel ways and is positioned automatically with a servo, then clamped in position with a hydraulic power lock.The CNC control allows programming of exact lengths and minimizes tube waste by allowing multiple part lengths to be cut from the same tube. The stop can be furnished in any length up to 15 feet. RELIABLE AUTOMATIC UNLOADING The automatic part unloader supports stock during feed out and machining of back end weld preps, chamfers and cut-off processing. BLOCK TOOLING Turning and boring tools are mounted on the rear two-axis slide in a solid building block type tool holder. 8 STATION TURRET Optional 8 station turret for parts that require additional tools. 8 STATION TURRET WITH LIVE TOOLING Optional 8 station turret with live tooling for parts that require drilling or milling. Automatic tube & bar loading of material from storage magazine into machine spindle as required. Automatic trimming of the leading end of each new tube or bar. Automatic ejection of the remnant end. Rail mounted pusher head with encoder feedback pushes stock through the spindle eliminating maintenance and marking problems normally associated with a roller feed or pinch roll device. Long tubes and bars are supported with the loading table steady rest system. No adjustment is required for different stock diameters. Stock diameter changeover is fast and easy with our electric screw-driven height adjustment. SPECIAL LOADERS can be supplied to handle material such as cast iron tubes and aluminum extrusions. Automatic, reliable unloading maximizes throughput Proper handling from start to finish is assured with a choice of unloading systems to fit your particular application. Long parts—such as hydraulic cylinder bodies are supported during feed out and machining of back end weld preps, chamfers and cut-off operations. Short parts—such as bearing races, gear blanks, piston rings, cylinder liners, transmission parts and spacers can be picked off during cut-off and retracted from the work area, stripped off the pick-off and discharged down a chute. Our innovative engineering and close attention to quality have kept pace with the pipe and tube industry’s need for efficiency and throughput. Servo-controlled tool adjustment and chucks with range adjustment and automatic tool change show that Bardons & Oliver has unparalleled expertise in the design, manufacture and operation of rotating cutoff equipment. Plus, our 100,000-square-foot modern manufacturing facility enables in-house design, machining and assembly of all equipment. Using the latest flexible manufacturing techniques, including multipallet shuttle machining centers, automatic tool changers and an ISO 9001 certified quality control system (featuring precision verification by CMM in an environmentally controlled atmosphere) assures unmatched precision part and machine quality. of quality, reliability, and customer service as a manufacturer of standard and built-to-order CNC Lathes and cut-off machinery for bar, pipe, and tubular stock, Bardons & Oliver has achieved ISO 9001:2008 with Design certification and has installed scores of GE Fanuc 18i and 32i controls.